Head tucked in her bag, hands clasped over the ears, Tzmugi was stuck in the abyss of emotions from the little quarrel with her friends a while ago. Tzmugi, was singing happily on a protruding pipe from the ground, acting as if it were a microphone. Her friends were enjoying the performance, until a few of them said some comments that made Tzmugi upset. They had a little argument, and Tzmugi stuffed herself into her bag after that. Chitosei and Nanako tried to “lift” their friend from her emotions, but it didn’t work. After a few attempts, the girls took a step back and stopped trying. The children picked up their bags, and continued walking to the next spot. 15 minutes later, Tzmugi was back with her friends, being her usual boisterous and hyper self. Being “stuck” in an emotion- or ego- arising state is common among not just children, but adults as well. Remember the last time you tried to apologise to your partner/friends, or tried to forgive your colleagues for the mistakes they made. How did you feel emotionally? Imagine a child who doesn’t yet have the expression or regulatory skills of a grown human. How would they deal with the “stuck” emotions? In the most beautiful way, the adults in the above-mentioned session “attended” to those emotions without giving in too much that they disempower the child. They stayed present to recognise and acknowledge the child’s emotion and state, but with the right rhythm in accordance with the situation, then asked for everyone to move along. Moving along was what empowered the child who was “stuck” to make the choice to let go of her “stuck” emotion without having an overarching power of instruction – but one instead that was kinder and more empathetic. It felt simple, and without the flurry of whining. This seems to be forest school in its advanced stage. I believe the initial stage and the moments with parents would be very much different. This empowerment of children enables them to engage and disengage their own emotion, and it is made more available in nature with greenery, fresh air and plenty of open space. The Nagayoshika takes its root in the community, environment, history, culture and geography of the Kamakura area. Their practices and way of raising children is rooted in inclusion, empowerment and independence of children through the communal effort of the collective family. Basically put, it takes a village to raise a child. What’s most impressive is seeing the resolve of the community and parents in doing it the forest school way. Allowing nature to do the teaching through play and exploration at their own pace. And doing it for the past 35 years amid the mainstream drive for achievement, that’s a great deal of commitment and will. Forest School is not just an education or program. It is a way of life. The community in the Kamakura area does it in such a beautiful and simple way. At the Nagayoshika, 65-year-old Aiko sensei leads the kids aged 3-5 years old, every Tuesday, Thursday and Friday. They also have a baby group, aged 1-2 years old, led by another Nagayoshika teacher. In Aiko’s session, they take a long hike through the mountainous region of Kamakura, stopping at times when the children find interesting things to explore. They are dressed to carry minimal items so as to be able to go the distance. Parents co-share and bus their kids down to the various drop off and pick up spots. (It is tough for the parents as well, but they are all in it together). Along the way, they will stop for lunch at a nice woody spot in the forest (simple onigiri and vegetables are always on the menu, diets are strict in this aspect). They have a simple “say your grace” before their meals. Aiko also tells a story before the meal. They have a little farm garden, where the farmed vegetables will be shared among the group on that day. It is impressive to see the Nagayoshika children trek for 3 hours in 7 degree Celsius, with the cold Kamakura winter air, in slippers and a light layer of clothes. Truly amazing champions. 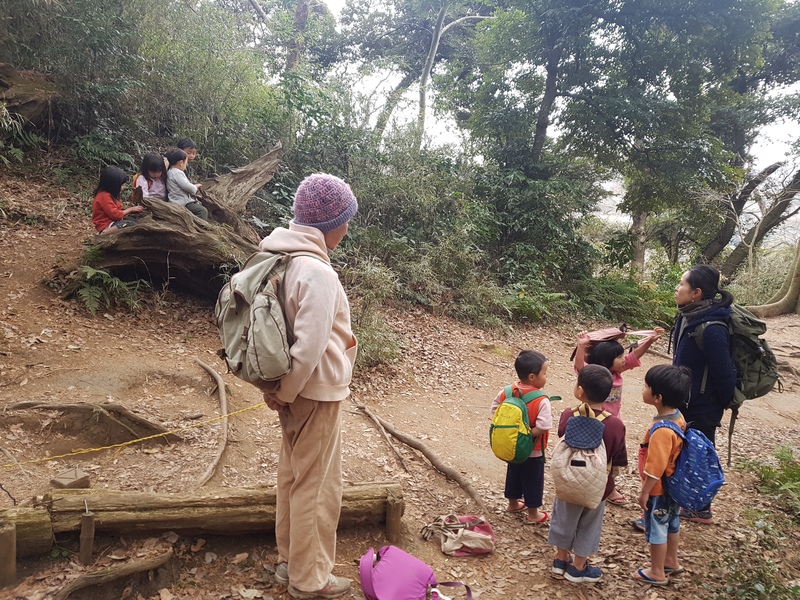 There are huge similarities in Forest School across Japan and Singapore, in how we manage the session. Kids are left to sort out their own conflicts, help each other through challenges, and take care of their own things and environment. Kids pick up sticks and little wild flowers along the way like every kid. This is the lifestyle and mind-set. The full version may not be for everyone. But if all of us can take small bits of this wisdom into our parenting, schooling, education and lifestyle, it will be a start to truly revolutionise our world towards a deeper connection with nature and ourselves.